The newly formed state of Uttarakhand is immediately recognisable because it is home to 4 of the most revered pilgrimage spots of Gangotri, Yamunotri, Kedarnath and Badrinath. Uttarakhand became the 27th state of the Republic of India on the 9th of November 2000. The State is carved out of Uttar Pradesh. It occupies 17.3% of India's total land area with 51,125 sq. km. It has a population of about 6.0 million at 94.4 per sq. km. It shares borders with Tibet and Nepal and with the Indian state of Himachal Pradesh, and has 13 Districts, split administratively into Garhwal and Kumaon divisions. With great views of the Himalayas, apart from the well known pilgrimages and hill stations, it offers wonderful travel destinations to lesser known places and offers much in adventure activities, like skiing, yachting, trekking and mountaineering. There are excellent ski slopes at Auli, Dayara Bugyal, Mundali and Munsiari. Auli, 16 kms from Joshimath has a winter resort run by the State government outfit, Garhwal Mandal Vikas Nigam (GMVN). The ski slope here is the most popular in the state and one of the few with ski lifts. The season starts from end December or January and extends up to March. This is a good place for beginners as GMVN conducts 7 and 14 days skiing courses at subsidised rates. The Government of India has awarded the National Tourism Award in the Category of Special Award for Efforts in the Development and Promotion of Tourism to the State Government of Uttarakhand, in 2002. Focused, planned and time bound development of trek routes, yatra routes and adventure sports such as river rafting, paragliding, skiing, mountaineering are planned by the state. The State Government is adopting the master plan approach for development of wayside amenities, new tourist destinations, development of Tehri Dam area as a tourist spot etc. Special emphasis is being accorded to promote cultural tourism and wildlife in the State. Dehradun is the capital city of the state of Uttarakhand. It is situated in the Doon valley at the Himalayan foothills with the Ganges in the east and Yamuna in the west. Legend has it that Guru Dronacharya meditated here at one time when the city was known as Drona Ashram. Sikh Guru Ram Rai camped at a spot where the Ram Rai Durbar is located and the name Dehra (Camp) is derived from this. The British found the climate here to be very pleasant and decided to establish many institutions including the Forest Research Institute, Indian Military Academy, ONGC, Survey of India, some of the best public schools like Doon School, Welhams, Col. Browns, Jesus & Mary Convent and St Josephs School. Very near Dehradun is the hill resort of Mussoorie. Other places of interest are Tapkeshwar temple dedicated to Lord Shiva; Sahastra Dhara, the sulphur springs; Robbers Cave a picnic spot; Tapovan a place where Guru Drona did penance; Kalanga Monument in memory of Gorkha General Balbhadra Thapa and the Ashoka Edict at Kalsi. The nearest airport is Jolly Grant, 24 kms from Dehradun. It is connected among other places, to Amritsar, Howrah, Bombay, Delhi, Lucknow, Varanasi and other major cities. Dehradun is well connected to other parts of India with a wide network of road routes. Rudrapayag, as the name specifies, is at the junction of two rivers, Alaknanda and Mandakini. It is situated on the route to Badrinath from Srinagar. From here the road bifurcates into two, one going to Kedarnath and other to Badrinath. This is a night halt for pilgrims and has many hotels and lodges. There is a small Jagdamba Devi Temple dedicated to Goddess Durga. 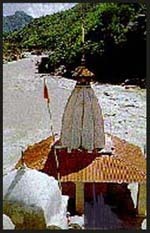 There is also an old temple dedicated to Lord Shiva, Rudranath temple. Legend states that Narad Muni meditated here for several years in return for which Lord Shiva blessed him with his musical talent. 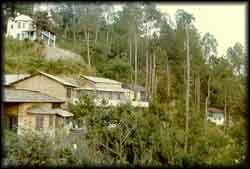 Pauri is the headquarters of Pauri-Garhwal district and Garhwal division. At a height of 1814 mts, on the northern slopes of the Kandolia hills, Pauri provides a delightful view of the snow clad Himalayan peaks of Bandar-Punch. It is a beautiful small town with lush green Deodar forests and scenic landscape. Kandolia Gap and Nag Tibba are two popular scenic spots. The nearest airport is Jollygrant (155 kms.) via Srinagar and Rishikesh. The nearest railway station is Kotdwar (108 kms.). Pauri is well connected by road to Dehradun, Rishikesh, Kotdwar and other cities of the Garhwal and Kumaon. Tehri, the headquarter of Tehri-Garhwal district, is situated at an altitude of 770 mts (2,325ft) at the confluence of Bhagirathi and Bhilangana rivers. The town is located in a wide open valley. Surrounded by forests of birch and pine, it is an important road junction from which roads branch off to Rishikesh, Deoprayag, Uttarkashi, Srinagar and Tilwara. Tehri was the capital of the erstwhile princely state of Tehri-Garhwal. Maharaja Sudarshan Shah founded the town in 1803. Earlier to which Srinagar used to be the capital. The palaces and temples built by the old rulers can be seen.The Tehri Dam has come up on the river Bhagirathi and the project is estimated to generate 2400 MW of electricity. The nearest airport is Jollygrant at 101kms. Rishikesh is the nearest railway station. Tehri is well connected by road to Dehradun, Mussoorie, Haridwar, Pauri, Rishikesh, Uttarkashi and other parts of the region. Uttarkashi situated near the river Bhagirathi has numerous ancient monuments and temples. The most famous temple is Lord Viswanath temple, dedicated to Lord Shiva. Nearby is the Shakti temple which has an old brass trident 26 ft high with a base circumference of 9 ft. There is also a temple of Parshuram. The town was named Uttarkashi because of similarities with the ancient and revered city of Kashi. The prestigious Nehru Institute of Mountaineering is located here. Nearest airport is Jollygrant, 162 kms. Nearest railway station is Rishikesh, 145 kms. Uttarkashi is well connected by motorable road to Dehradun, Rishikesh, Haridwar and other major towns of the state and region. Chamoli is situated near the river Alaknanda on the way to Badrinath. It is a small town and not on the tourist map. It is 10 km beyond Nandprayag and 10 km before Gopeshwar. Nearest airport is Jollygrant, 221 kms. Rishikesh is the nearest Railway station. Well connected by road to Dehradun, Haridwar, Rishikesh, Nanital, & Almora. Nearest airport is Jollygrant -159 kms. Nearest Railway station, Rishikesh -142 kms. Well connected by road to all the important places of Garhwal Division. The nearest Airport is Jollygrant (41 kms).By rail it is connected with all important Cities of India viz., Bombay, Delhi, Agra, Howrah, Varanasi, Allahabad, Ujjain, Amritsar, Dehradun, Lucknow, etc. By road Haridwar is located on National Highway no.45 and is 214 kms from Delhi. This is the best known and frequented hill station of Kumaon. The city is built around the Naini Lake and is surrounded by seven mountains Sapta Shring. Nainital was the summer capital of Uttar Pradesh for many years during British regime and also after independence. Mythology states that when the grieving Lord Shiva was carrying the corpse of Sati, her eyes fell at this place and it thus came to be known as Nainital. This is an extremely popular hill station. Nearby places of interests are Bhimtal, Sattal and Naukuchiatal. The nearest airport is at Pantnagar and the nearest Railway Station is Kathgodam (35 kms.) connected to Lucknow, Agra, Delhi & Howrah. Bus services run from Nainital to Almora (64 kms. ), Badrinath (334 kms. ), Bareilly (140 kms. ), Dehradun (387 kms. ), Delhi (326 kms. ), Hardwar (310 kms.) and Kausani (117 kms). Almora is a hill district in the central Kumaon region of Uttarakhand. It is a beautiful scenic town situated at an altitude of 5900 ft. It was founded by Raja Kalyan of Chand Dynasty in 1560AD. There is a cave where Swami Vivekananda meditated and was enlightened. Almora was captured by British from Gorkhas, who have left their mark on this town. The Nanda Devi festival is celebrated here, during which devotees from all over India visit this place. Almora is very popular among tourists from nearby cities who come here during the summer for a holiday. There are very enchanting spots nearby such as Jageshwar, Binsar and Sitlakhet. The nearest railroad station is Kathgodam from where jeeps or bus have to be taken. The nearest railway station is Kathgodam (90 kms.) which is connected by rail with Lucknow, Delhi and Howrah. Connected by road with most places of U.P. Distances are: Lucknow (466), Dehradun (412), Nanital (71), Delhi (382), Bareilly (205), Kathgodam (90), Pithoragarh (122), Hardwar (357) and Haldwani (96). Bageshwar is a district town located in enchanting surroundings. According to mythology Lord Shiva wandered this area in the form of a tiger (bagh). There is Baghwat temple dedicated to Lord Shiva, build by Raja Laxmi of the Chand Dynasty and many pilgrims visit it during the Uttarayan fair. Bageshwar is also frequented by trekkers since it is the starting place for Pindari, Sunderdhunga and Kafni glaciers. Nearest Airport - Pant Nagar, 206 Kms. Nearest rail head is Kathgodam, 180 kms. Champawat is a historical town with magnificent scenery and landscapes. There are many ancient temples including the Baleshwar Temple and Rataneshwar Temple. There Nearest Air Port is Naini Saini, 80 kms away at Pithoragarh. Nearest railhead is Tanakpur, 75 kms. Well connected to Nanital, (233) kms, Haldwani, 193 kms and Tanakpur 75 kms. This is the northernmost district town in the Kumaon region of Uttarakhand. This place is endowed with natural charming beauty with many valleys and snow-covered mountains. It is the starting point of the trek from India to Manasarovar Lake and Mount Kailash in Tibet. Nearest Airport is Nani Saini, 5 kms. Nearest railhead is Tanakpur, 151 kms. Well connected by motorable roads to Tanakpur as well as Kathgodam and Almora and Nainital. This newly formed district is named after Udham Singh, the freedom fighter who had avenged the JallianWala Bagh massacre by killing killed General Dyer .It is a charming tourist spot. Nearest Airport - Pant Nagar, 11kms.Udham Singh Nagar is well connected to Delhi, Lucknow and Calcutta by rail. Also well connected by road to important towns. Delhi - 254 kms, Agra - 301 kms., Lucknow - 343 kms, Faizabad- 473 kms, Ayodhya- 481 kms, Gorakhpur - 620 kms, Kashipur - 56 kms, Tanakpur - 101 kms, Hardwar - 228 kms and Dehradun - 285 kms.